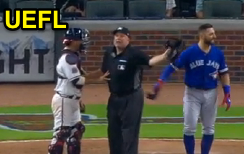 "What you permit, you promote" is an officiating axiom that may apply to bench clearings, as yet another rhubarb took place in baseball, this time between the Blue Jays and Braves in Atlanta. Like the first bench clearer of Wednesday—Dodger vs Giants Bench-Clearer and Division of Halves—the twilight edition in Atlanta featured a batter upset with the way a pitcher threw a pitch, and both teams responded by encroaching upon the playing field, as they did for a second time just one inning later when one team took umbrage at a batter celebrating a home run. O'Nora tries peacekeeping after Pillar's action. With two out and none on in the top of the 7th inning of an 8-3 ballgame, Blue Jays batter Kevin Pillar prepared to face 0-2 pitch from Braves pitcher Jason Motte, which came as a swinging strike cutter for the third out of the frame...except that Pillar was upset with Motte's accelerated cadence in delivering the pitch, and verbalized some complaint to that effect, causing Motte to walk towards the plate and Braves catcher Kurt Suzuki to attempt a confrontation of his own as Pillar turned away in a "I want the last word" type of maneuver. As far as quick pitches are concerned, Ramon De Jesus recently (on April 23) ejected Blue Jays Manager John Gibbons for objecting to his illegal pitch, automatic ball call. For that situation, replays indicated that the batter was not ready to receive the pitch when Gibbons' pitcher delivered it, while in Atlanta, Pillar did appear set to face Motte's pitch—Pillar just did not expect Motte's cadence to be so quick. The field naturally is halved after Pillar's K.
The key distinction lies in Rule 6.02(a)(5) Comment, which states, "A quick pitch is an illegal pitch. Umpires will judge a quick pitch as one delivered before the batter is reasonably set in the batter’s box. With runners on base the penalty is a balk; with no runners on base, it is a ball. The quick pitch is dangerous and should not be permitted." Thus, because Pillar was reasonably set in the batter's box when Motte effected his delivery, the pitch was legal and, by rule, not a "quick pitch." Thus, HP Umpire Brian O'Nora—who passionately motioned to the Atlanta bench to return to the dugout—allowed it, and the strikeout stood. Benches clear a second time in Atlanta. Just one inning later, Blue Jays batter Jose Bautista hit a solo home run off pitcher Eric O'Flaherty to bring Toronto to within four runs, and flipped his bat in celebration. 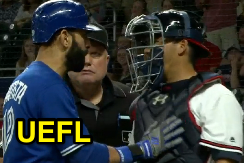 Upon his arrival at home plate, he became engaged in a verbal entanglement with Braves catcher Suzuki, who, already displeased with Pillar's conduct, wasn't happy that Bautista had celebrated his home run in such fashion. Earlier in the home run trot, Braves first baseman Jace Peterson had attempted to confront Bautista, but Bautista ignored him. Again, the benches cleared, again the umpires broke up the fray, and again no ejections resulted. Toronto's most recent bench clearing incident occurred on September 26, 2016, and resulted in four ejections. Atlanta's most recent bench clearing incident occurred on September 14, 2016, and resulted in one ejection. Did the benches really need to clear for this? 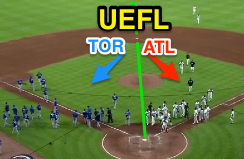 Prior to this, the Blue Jays fought the Texas Rangers on May 15, 2016, while the Braves fought the Brewers on September 25, 2013 (also as the result of a catcher unhappy with a batter's home run celebration). Last year, we discussed Psychology & Marketing - Why MLB Discipline is Weak. The premise of the discussion concerned MLB's aloof attitude regarding discipline for misconduct: without question, a bench clearing incident in high school or college will likely result in at least one ejection, if not an outright forfeited game. In the Majors, however, bad behavior is theatre, and nothing stirs up ratings quite like two entire teams out of their dugouts (and bullpens). If the League itself doesn't particularly care to punish teams who needlessly delay the game with unsporting acts, then its umpires are not in a position to do so either, unless absolutely necessary. In conclusion, "baseball tacitly encourages ejection-able behavior [and bench clearing incidents] through its weak penalties because, as a business—as the American pastime hoping to retain relevance in the new era—it must." In conclusion, whether this counts as entertainment or a ridiculous mockery of baseball, one thing is for sure: Repeated bench clearing incidents aren't good for baseball's vaunted pace-of-play dilemma. Video via "Read More"